A favourite of Hang/HandPan musician, ‘Daniel Waples’, ‘Cas Cas’ are percussive / shaker instruments native to African countries, that are traditionally constructed from the gourds of the West African Swawa tree, filled with tiny pebbles, or beans, connected by small rope. 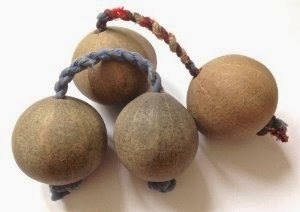 Also sometimes known as: ‘Aslatua’, or ‘Kashaka’ (among other names), Cas Cas can be played in many ways, but generally they are played by holding one gourd in the palm while simultaneously shaking and swinging the second gourd, using the hand and arm movement combined with gravity and speed to create rhythms. And with a little practise, can be used to add some pretty effective one-man accompaniment to the sounds of the HandPan. Cas Cas create both shaking sounds, and percussive clicks, and in addition to being a percussive instrument in their own right, Cas Cas are also useful as a skill-development tool: that can help improve dexterity, ambidexterity, brain hemispheric synchronization, and develop the ability to multi-task. It can also build muscle mass and improve flexibility in the hands, arms, shoulders and chest. And they are also used by some as a meditative tool, used to induce a trance state, promote relaxation, and lower stress levels.